Who gathers health information online? Health information gathering online has been consistently popular over the last decade. Eight in ten internet users looked online for health information in 2002 and the same proportion do so today. What has changed is who has access to the internet. With the exception of adults age 70 and older and those with less than a high school education, internet use has shifted from being exceptional to being commonplace. And the Pew Internet Project’s consistent finding is that if someone is online, they are in the game when it comes to all kinds of online activities, including health information seeking. What follows are thumbnail sketches of notable groups of health information seekers. Men and women are equally likely to have internet access: 73% of men and 75% of women go online. However, in a familiar pattern, women continue to pull ahead when it comes to pursuing health information online:3 86% of online women do so, compared with 73% of online men. Online women significantly outpace online men in their pursuit of information about specific diseases or medical problems, certain treatments or procedures, doctors or other health professionals, hospitals or other medical facilities, food safety or recalls, drug safety or recalls, and pregnancy and childbirth. Not a single topic included in the survey attracts more attention from men than from women. The word “caregivers” is used throughout this report to refer to people who, in the past 12 months, have provided unpaid care to a parent, child, friend, or other loved one. Unpaid care for an adult may include help with personal needs or household chores, managing finances, arranging for outside services, or visiting regularly to see how they are doing. Unpaid care to a child includes care for an ongoing or serious short-term condition, emotional or behavioral problems, or developmental problems. Seventy-nine percent of caregivers have access to the internet. Of those, 88% look online for health information. Caregivers distinguish themselves in this study as people focused on health information. They outpace other internet users when it comes to researching every single health topic included in the survey, often by double-digit margins. A report coming out later this spring will profile caregivers in greater detail. Differences among adults with various levels of education are echoed in health information gathering online: 89% of internet users with a college degree do so, compared with 70% of internet users with a high school degree. The numbers drop even further when looking at adults who have less than a high school education – just 38% go online and, of those, 62% say they gather health information online. Thus there is a magnifying effect where online health information seeking is concerned; not only are some groups more likely to have internet access, but those same groups are generally more likely to seek health information once online. College graduates outpace high school graduates by 20+ points on a majority of health topics included in the survey. There are exceptions, however. Information about pregnancy and childbirth attracts equal levels of interest from internet users at all education levels, as does information about end-of-life decisions. Again, the disparity is repeated in the two groups’ likelihood to look online for health information: once online, 87% of upper-income internet users do so, compared with 72% of internet users living in lower-income households. Nearly half of U.S. adults live with a chronic disease such as high blood pressure or diabetes.8 The current survey asked about five major diseases – high blood pressure, heart conditions, lung conditions, diabetes, and cancer – plus a catch-all question to capture any chronic conditions not included in the list. That pattern is repeated in the current survey: 64% of adults living with at least one chronic condition have internet access, compared with 81% of adults who report no chronic conditions. Yet once online, 83% of internet users living with chronic conditions say they look online for health information, compared with 77% of internet users living with no such conditions. Indeed, internet users living with chronic conditions are keen to gather health information online, particularly about specific diseases, treatments, health insurance, and drug safety or recalls. They outpace or match other internet users on nearly every topic. The one exception is information about pregnancy and childbirth, which is more popular among people not living with any of the conditions named in the survey. A report coming out later this spring will profile people living with chronic conditions in greater detail. 15% of American adults say they have serious difficulty walking or climbing stairs. 11% of American adults say that, because of a physical, mental, or emotional condition, they have serious difficulty concentrating, remembering, or making decisions. 9% of American adults say they have serious difficulty hearing. 8% of American adults say that, because of a physical, mental, or emotional condition, they have difficulty doing errands alone such as visiting a doctor’s office or shopping. 7% of American adults say they are blind or have serious difficulty seeing, even when wearing glasses. 3% of American adults say they have trouble dressing or bathing. People who answer “yes” to any one of the above questions are categorized as living with a disability. In addition, 2% of American adults say they have a disability or illness that makes it harder or impossible for them to use the internet. Fifty-four percent of adults living with a disability go online, compared with 81% of adults who report none of the disabilities listed.10 Once online, the two groups are equally likely to use the internet to gather health information: 78% of internet users living with disability do so, compared with 80% of internet users with no disabilities. Internet users living with disabilities are just as likely as other internet users to research most health topics included in the survey, with the exception of information about doctors or other health professionals and information about pregnancy and childbirth. Both of those topics are more popular among internet users who report no disabilities. Twelve percent of American adults say they personally faced a serious medical emergency or crisis in the past year. One in four American adults (27%) says someone close to them faced such an emergency. There is no statistical difference in internet adoption rates between those who experienced a medical crisis, their own or someone else’s, and those who did not. Serious medical emergencies cut across all demographic groups and seem to bump up interest in online health research. Fully 85% of internet users who experienced a recent medical crisis say they look online for any of the health topics named in the survey, compared with 77% of internet users who have not had that experience in the past year. In fact, those who went through a serious medical situation in the past year out-search their counterparts on every topic but one: pregnancy and childbirth. Two-thirds of adults in the U.S. have a home broadband connection. Younger adults, those with higher levels of education or income, and those living in urban or suburban areas are the most likely groups to have broadband access at home. Eighty-two percent of home broadband users go online for health information, compared with 67% of internet users with dial-up access. Broadband users are more likely than dial-up users to look online for eight of the fifteen topics included in the survey. Eighty-three percent of wireless internet users have looked online for health information, compared with 70% of internet users who do not use a mobile connection. Wireless users have wide-ranging interests: they significantly outpace their desktop-bound counterparts on thirteen of the fifteen topics included in the survey. For example, 48% of wireless users look online for information about doctors or other health professionals, compared with 31% of internet users who do not have mobile access. Eighty-five percent of American adults own a cell phone. Older adults are less likely than younger adults to use a mobile phone, but their numbers are still robust: 58% of adults ages 65 and older own one. Disparities in access and in interest in health information once again combine to magnify differences among groups. 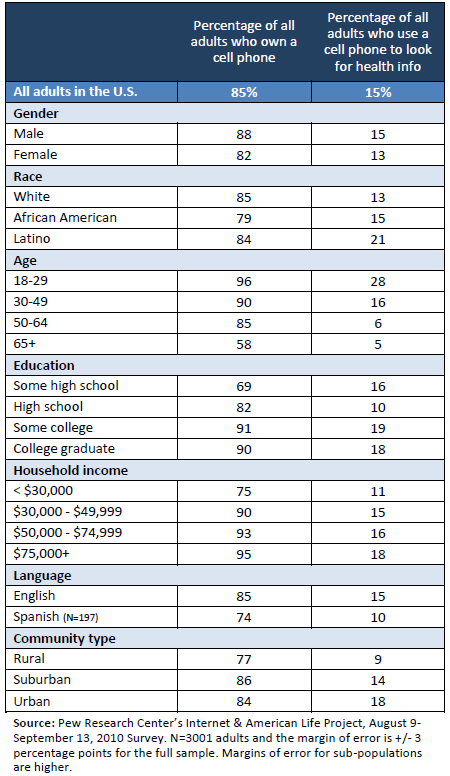 The table below details the percentage of adults in each demographic group who have access to a cell phone and who use a cell phone to look for health information. 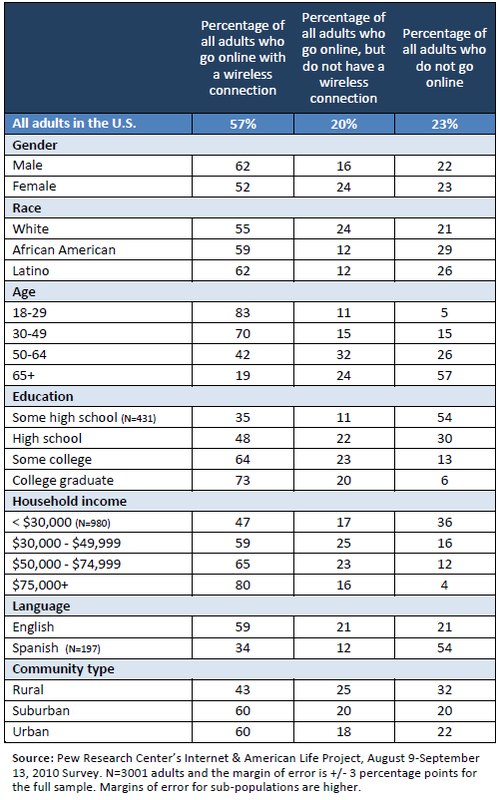 For example, younger adults are much more likely than older adults to both have a cell phone. Younger cell phone users are also more likely than older ones to use their phones to look for health information. The result is significant gaps among demographic groups when it comes to on-the-phone health searches.